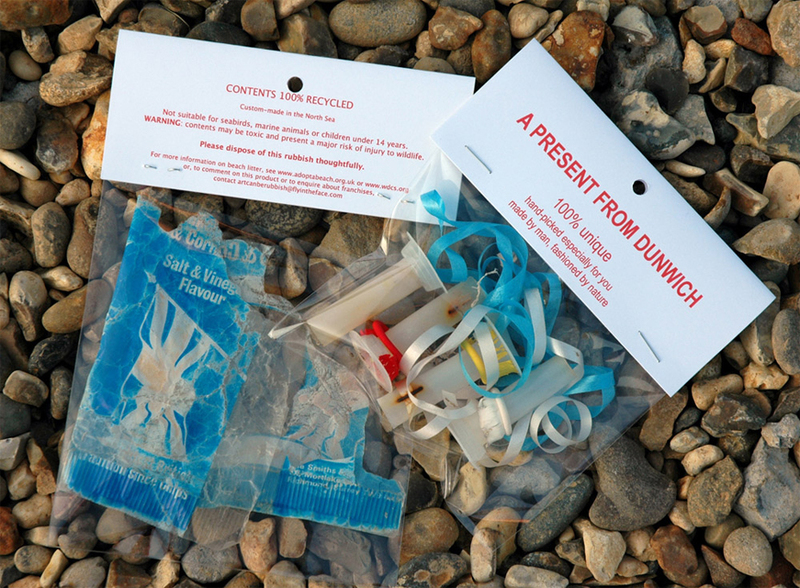 In order to highlight the problems of marine and beach litter, I collect beach debris and package it as souvenirs. Whether in the gallery, the market or on the beach, I set up stall and offer the products for 'sale' in return for a donation in support of charities who are campaigning to protect our oceans. A publicity campaign accompanied the initial launch at Thorpeness, Suffolk, in April 2006 - see press release - and coverage included live radio interviews. Further events have taken place at Dunwich, Wells-next-to-the sea, Norwich, Ely, Great Yarmouth, Southwold, London, the Isles of Scilly and Felixstowe.In addition my present from souvenirs have featured extensively in exhibitions in USA (notably as part of the acclaimed GYRE exhibition organised by the Anchorage Museum in Alaska in 2014), Spain and Portugal.